I was watching one of the Presidential debates and pretty much vomited in my mouth over all the political horseshit, so I needed a serious palate cleanser. 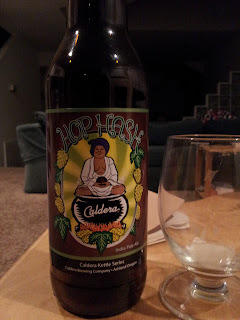 Suddenly, Hop Hash. This beer gets its name from the Hopunion Hop Hash nuggets - pure hop lupulin extracted and scraped from the Hopunion pelletizing line, then boiled for 90 minutes in the kettle. According to the brewer, this has never been done before! Premium 2-row, Great Western Munich, Crisp 60L and rolled oats comprise the grain bill designed to carry this load. Fermented warm using American Ale yeast to bring out the fruitiness, the resulting beer is designed to be a surprise on all fronts. Even the brewer has no idea how hoppy it’ll be. For those confused, I'll put it in stoner terms: This is like harvesting the resin from your iced-bong. The idea here is really interesting to me. It seems like you could easily obliterate a beer by going overboard on the hop-hashish, but I think they managed to pull it off quite nicely. There will probably be people who claim using hop-oil extraction techniques aren't "authentic", but they're probably the same peeps who use Stevia to sweeten their iced tea, or drink 64oz Big Gulps of Mountain Dew. My point is, as long as the hoppiness isn't from some strange synthetic source, who cares how you get it in the beer? Yes, it's probably not as challenging a process as brewing under an ultra precise, complicated hopping schedule is, but clearly the effect can be the same. I enjoyed it, but probably won't revisit it. Although the description above suggests it could improve (or worsen) in the future, so maybe a second-take is called for. Oh, and go vote. But only for the candidate that makes you want to vomit the least. * After I finished the bottle, I realized the review needed a picture. Oops. So, no beer - just the bottle. But, honestly, you should expect very little of me after this, and that.